Imagine this; your router is on the ground floor by the front door, while the TV you want to plug your CCTV into is upstairs or in your living room. Traditionally, you might contemplate on drilling a hole on the ceiling and running dozens of yards of ethernet cables through the hole and finally to the destination, which makes your home messy and untidy. 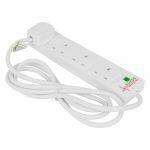 However, this Nano Powerline Ethernet adapter kit makes your home existing socket not only a way to provide power but also a way to transmit internet connection. It saves you all the trouble and is an easy way to fix the problem. If you’ve been recommended this adapter by our engineer, then add it to your order and the engineer will fully set it up for you on the day of your installation. With its new ultra-compact housing design, the TP-Link Powerline TL-PA4010KIT is much smaller than TP-Link’s legacy mini 500 Mbps powerline products. At just 28.5 mm thick, it neatly blends in to your domestic environment. The TP-Link Powerline TL-PA4010KIT, is one of a new-generation of powerline adapters, with a practical design and a sophisticated power-saving mode that consumes less power when compared with existing powerline adapters. When there is no data transmission or reception over a certain period of time, it will automatically switch from its regular “Working” mode to “Power-Saving” mode that will reduce energy consumption by up to 85%*.